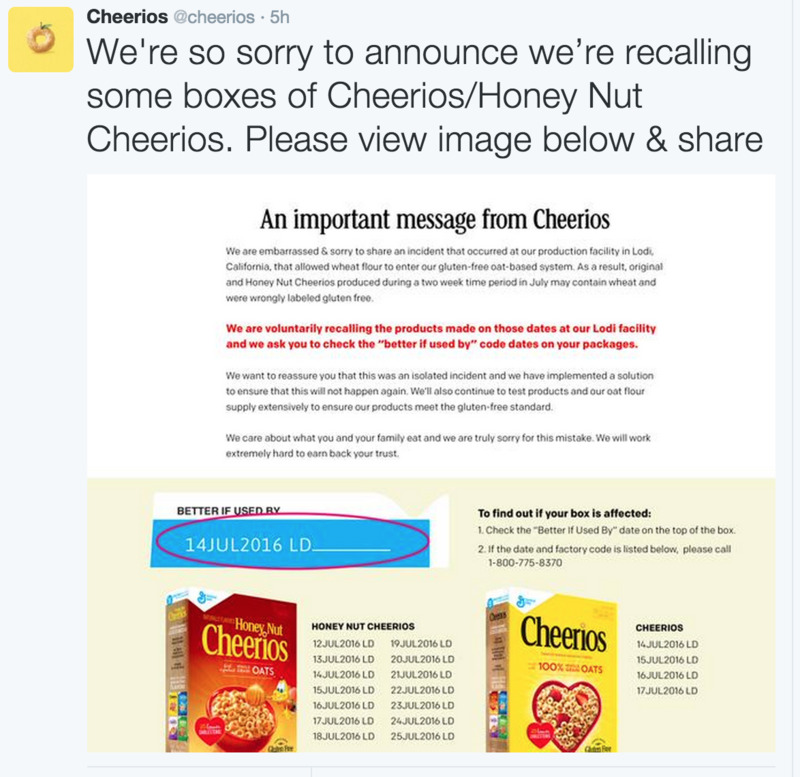 Foodista | Food Recall: Gluten Free Cheerios! According to the official Cheerios blog, President Jim Murphy announced that some of the product produced at the Lodi, California plant "In an isolated incident that was the result of human error, wheat flour was inadvertently introduced into our gluten-free oat flour system." Murphy went on to say that the mistake occurred at just the single facility in Lodi and that Cheerios and Honey Nut Cheerios in other plants were not affected. The comment section was filled with concerned consumers, and Cheerios continued to respond immediately to every question and comment. This is a good example of a company that understands the importance of social media, and responded in a positive and humble way. As a mom with a gluten free child, I will carefully check the date and factory code of my newest 2 boxes of Cheerios, and probably for the foreseeable future, but will also continue to be a satisfied customer. This incident is dangerous to some, an inconvenience to others, and unfortunate for a company that listened to what consumers really wanted, and is try to create products to meet that need. Thank you General Mills, for apologizing, for your sincerity, full disclosure, and for understanding that this mistake involves our health. Our family will remain loyal, and continue to be vigilant about monitoring the gluten free foods that we all want. It's a relationship built on trust, and we have got your back.